Around 80% of them raised their hands. The priest then asked: “And how many of you intend to forgive your enemies?”, and almost everyone’s hand was now in the air. Everyone except a feeble, old lady in the front row. How are we doing in Tama County? According to the 2017 Iowa State University (ISU) Retail Trade Analysis report, not too bad. 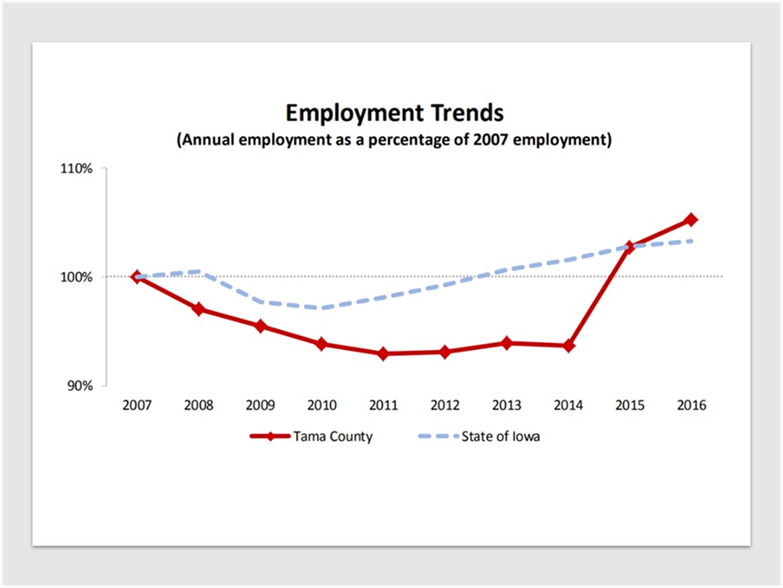 The chart below shows the 10- year trend in wage and salary employment in Tama County. Each year’s employment, which counts full-time and part-time jobs equally, is expressed as a percentage of baseline year employment. The statewide trend is included for comparison. Area job growth creates earnings opportunities for current residents and it also helps to attract new residents to the region.